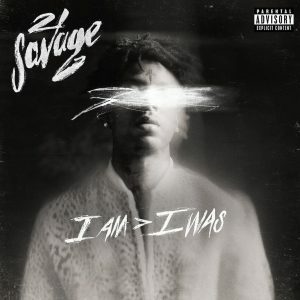 After months of appearances on some of the most successful records of the year, many wondered if the second major-label solo album from 21 Savage would arrive by the end of 2018. Much to everybody’s surprise, and without much warning, Atlanta’s best trap artist has returned with his follow-up to a debut that could have brought more. i am > i was, despite being only the second solo album from 21, is really the fourth piece of work from him. Savage Mode, a collaborative effort between him and producer Metro Boomin that shook the hip-hop scene came first, followed up by his first full-length Issa Album. Without Warning came afterwards, his project with Offset, a member of Atlanta rap group Migos. The album is kicked off with the best song on the collection, “a lot.” There’s a somber and mournful tone to the song, featuring 21 reflecting back on the worst times of his life. “break da law” is another highlight, with Savage sounding like his best self verse after verse. “The chopper can hit all of y’all, your brother, your goldfish and dog” as the hook really made me laugh the first time around. Even though 21 shines on most songs on the record, it’s packed with features. After teaming up on one of the most streamed songs of the year, “rockstar,” Post Malone joins 21 for “all my friends.” The hook is catchy, the beat is loaded with 808s, and Posty is all over the track. Childish Gambino makes his return to rap since releasing his hit single “This is America” and teams up with 21 on “monster,” making it one of the best songs on the album. The track is groovy, the hook is easy to get stuck in your head, and the Gambino verse is great. Where this album falls short, however, is in it inconsistency. While it has many hits, it also has many misses. “good day,” “pad lock” and “ball w/o you” feel like filler tracks off the 15 song, 51-minute album. Quite honestly, they’re pretty forgettable. 21 clearly isn’t bringing the absolute best he can bring to the table for the entire album, so you can’t call it anything close to “legendary” or “groundbreaking,” like some of his current contemporaries. You can’t compare this to To Pimp a Butterfly or The College Dropout, but you can definitively call it a good record.